A Bride On A Budget was provided one of these sashes for review. All thoughts are my own. A while ago, someone asked me for budget-friendly home style bachelorette party ideas. I thought of a pot luck (where everyone brings an app, cocktail, etc. ), followed by going to a comedy club. I didn't, however, mention my friend's "bachelorette party," which involved doing errands all over town (getting our nails done, our eyebrows done, passing alpacas on the street), all while she wore a bridal sash. 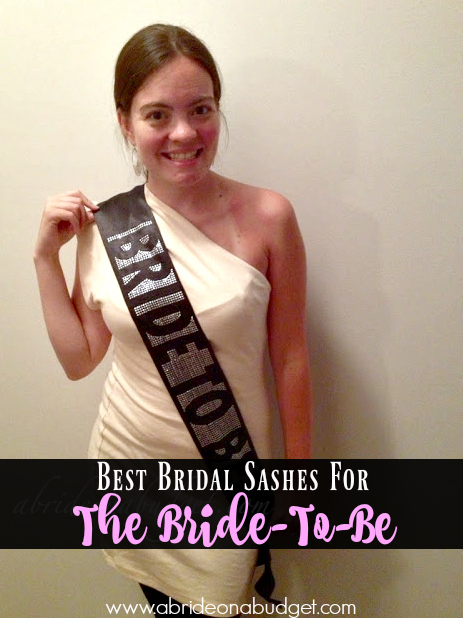 Oh the awesome, yet sometimes dreaded, bridal sash. Personally, I think they're awesome ... but maybe that's because I've never actually been the one forced to wear it all day long. If you're getting married, get ready for the sash. And if you're planning a bachelorette party, this is a great list for you. This lace bachelorette sash is my favorite, which is why I'm kicking this post off with it. It's a pretty lace, which means it won't take away from the dress the bride is wearing that night. Plus, with it being lace, it just looks fancier than any other bridal sash. And if your bride is sort of fancy, and planning on wearing a fancy dress, this is perfect. You can pick it up in white, black, or pink (if you choose the latter two, the letters are silver, not black). 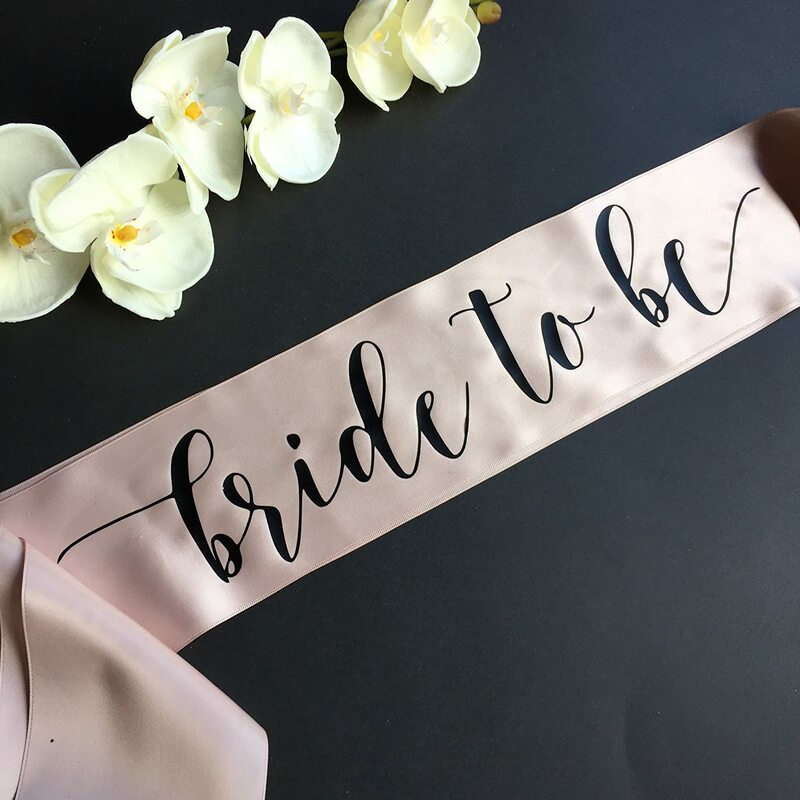 How cute is this bride-to-be sash? It's pretty sweet and understated, in case your bride doesn't really want to stand out while she's wearing this. But, it's not too plain either. It has an engagement ring embroidered on it, making it a little more special. Unlike most of the sashes that are one-size fits all, this one actually is fastened with Velcro. That way, you can actually adjust the length and make sure it fits your bride-to-be. I didn't actually change my last name. I've had this one for so long, so I just kept it. I actually have a ton of friends who did the same, so maybe our generation is completely balking at this. 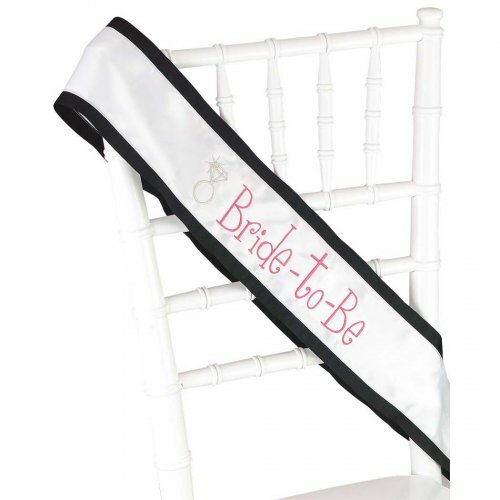 But, if your bride is changing her name, this personalized bridal sash is for her. You can personalize this with up to 20 letters, which means you have some room to be creative. 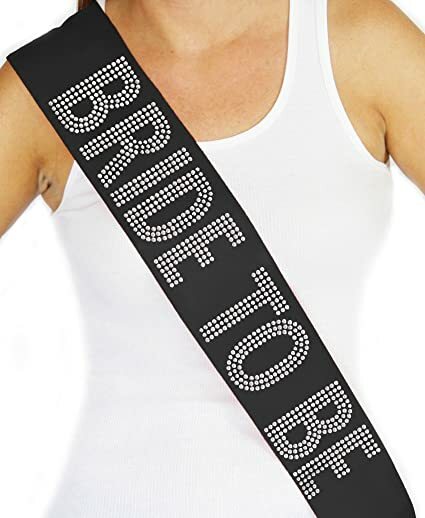 I really like this champagne bride-to-be bachelorette party sash. It's just so pretty and feminine. And the champagne color is just gorgeous. It's such a break from the normal white, pink, and black that these often come in. And the font on this is just super pretty too. It doesn't look cheap or cheesy, which perfect for any bride. Aside from the color, I like the Super Glam Rhinestone Sash a lot. The rhinestones are affixed very well to the sash, which means your sash should still say "Bride To Be" after a night of bachelorette debauchery. The sash is made of a slippery material (I want to guess some sort of poly-blend) but it doesn't slide. When you put it on, it stays put. It's not going to twist and turn, hiding the B on your shoulder so this reads "Ride To Be" by the end of the night (since that is absolutely not what you're going for). So it's good to know this will stay put. This is something that you can pass along from girlfriend to girlfriend and the sash will definitely hold up. Just don't wash it in a machine. Spot clean only works for them. And don't iron on the side with the rhinestones. Use low heat on the backside to help the sash's longevity. 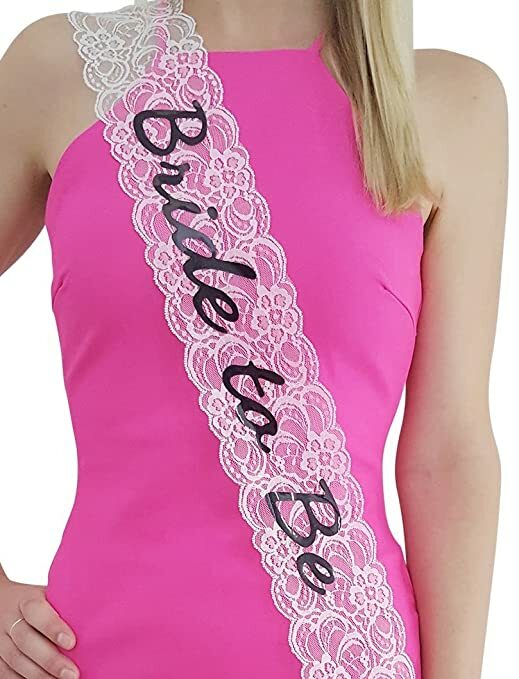 BRIDAL BABBLE: Did you get a bridal sash to wear for your bachelorette party? Alpacas, how cool is that!!!!!! omg lisa that is not a tan. yikes looks painful! My fave is the glam one! Great round-up!